I had quite a few emails and questions after I posted the video about grouping and resizing in Design Studio so I thought it might be a good idea to make a second video to answer them. If you missed the last video, here is a LINK to the post. 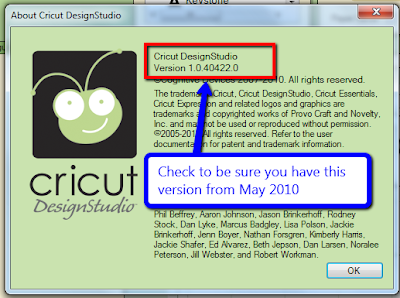 If you want to use the grouping and resizing functions, you need to be sure that you have the current version of Design Studio installed. The last update was in May of 2010. When you click on the help menu at the top of your Design Studio screen, chose "about" at the bottom of the drop down menu. You should have Version 1.0.40422.0. 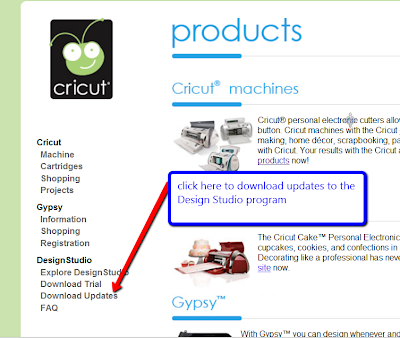 If you have an earlier version of the software you need to go to cricut.com to download the update. 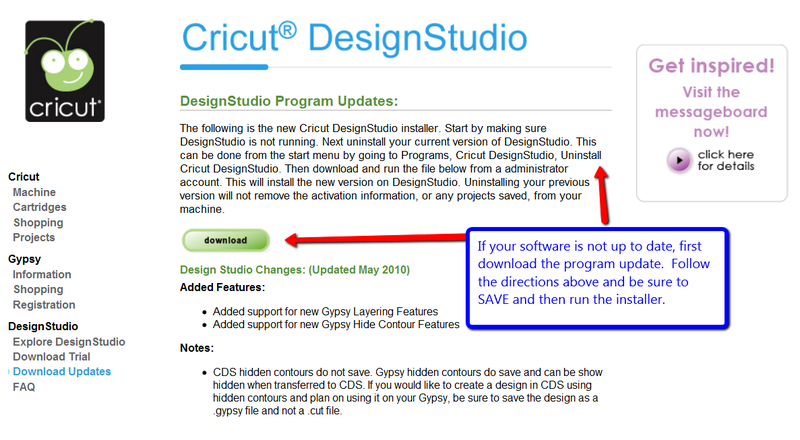 If you have recently purchased Design Studio, the CD in the box will not have the most updated version. You should simply download the latest version and use the number printed on the CD envelope in the box to activate your software. 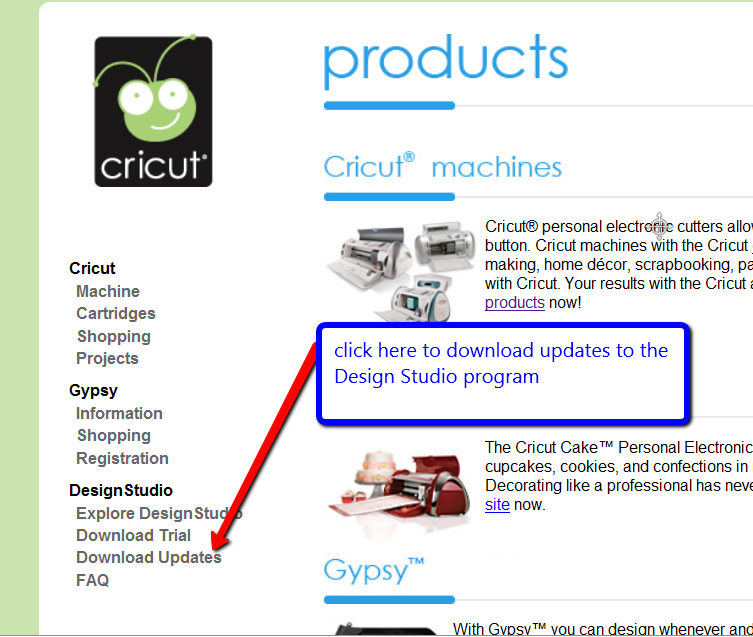 From the home page, click on "products" at the top left and then click on "download updates" under Design Studio. If you are not signed in to the site you will need to sign in before proceeding to the download page. Here is the direct link Design Studio Updates. To update the program follow the directions provided. 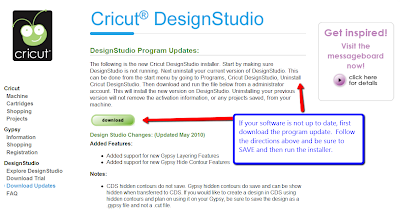 You should uninstall the current version first to avoid problems with the installation. When you do this, you will find that you will need to relabel your cartridges into the "my cartridges" and "favorite cartridge" categories under the Preferences menu. If you have added keywords to any of the carrtidges, these will also need to be redone. Some people install the new version without uninstalling the older version and have no problems. 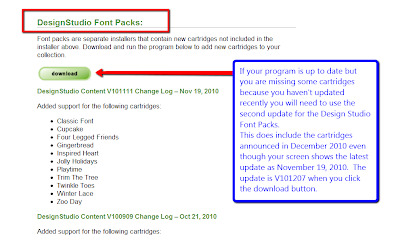 If your program is up to date but you are missing some of the cartridges, you need to download and run the second update for the DesignStudio FontPacks. Be sure to SAVE the download and then run it to make sure that the cartridges are added. If your program is open when you do this you will need to close and reopen the program to see all of the cartridges. 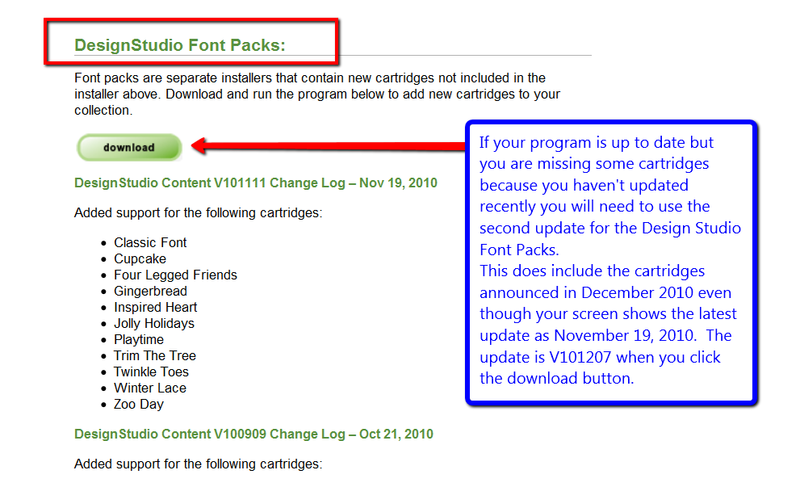 The screen says that the most recent update is from November, 2010, however, if you click and download you will find that the version is V101207 which includes the cartridges announced in December so you will be up to date. This is the test cut of the frame that I designed in this video. I'll be using this in a project that you'll see next week. Please let me know if you have any questions or need help with the grouping. It makes Design Studio much more useful and lots of fun too! I had to of course do things the wrong way round the first time by using a flipped image but this video showed me exactly what I had done. Thank you for all your time it has made the making of beautiful frames so much easier. 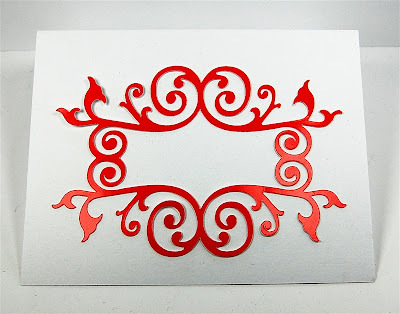 I consider myself a pretty savvy DS user, but I have to say that everytime you post a tutorial I learn something or somethings new! PC should be paying you a salary for all the help you offer and business you give them! Thanks so much Diane! Thank you so much for anwering my question about crouping and resizing. And I agree with Clare, they need to pay you. Everytime when I am at the craft store and I see people looking at cartridges I tell them about your site. How helpful you are with the DS!!! Thanks again for always willing to help us. Thanks so much for your videos and tutorials on the DS. They are very helpful and I always learn new things from you which helps me use the DS more. Thanks again. When I was working with a flipped item in DS, and it kept 'unflipping', I thought I was doing something wrong (or possibly loosing my mind, ha!). Thank you for showing me that it's 'normal'. Hopefully they will fix this bug on the next release.... a girl can hope! Thank you again for sharing your knowledge. Provocraft needs to hire you just to do videos for them. I agree with Cathy! Provocraft should hire you! Thanks for being so willing to share your incredible wealth of knowledge! Thanks for sharing. I thought I was using DS wrong because I had to keep flipping my shapes. Provocraft needs to upgrade DS so that it does the same thing as a Gypsy! Thanks for all your helpful posts! Any time I have questions about Design Studio, I know your blog is the best place to get the answers! Thanks so much for this! I didn't have the right version down loaded. But now it is and I can do this!!! Awesome explanation and step by step instructions! Thanks so much! Thanks so much for your second video on grouping. I was working on a design where I had flipped an image and finally gave up and designed it on my Gypsy instead. Now I know how to handle it when it comes up again. I really prefer DS over my G due to the screen size. Thank you! Thank you! Thank you! I wasn't aware of this "new" feature. Wow, am I behind the times or what?? 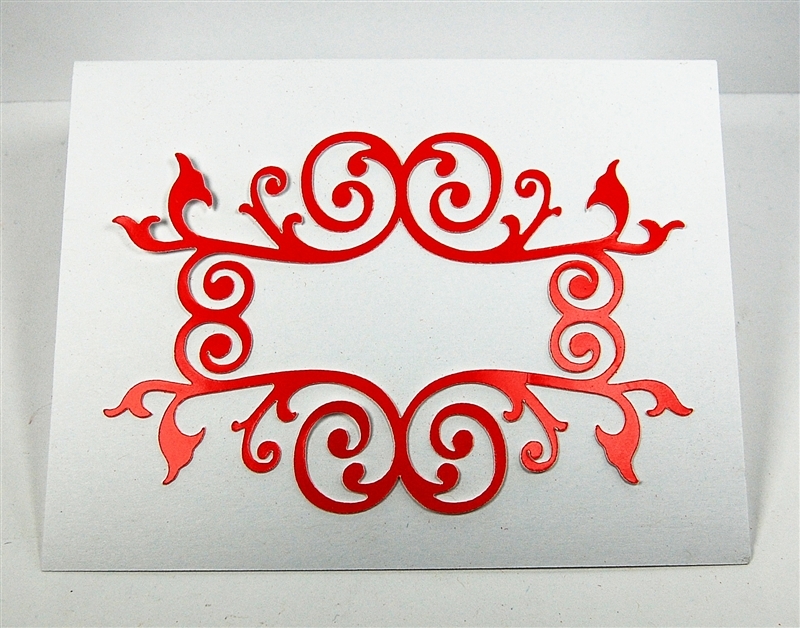 I am so excited to use this for a multitude of applications with card making and scrapbooking. Again, thank you. You have made my day.